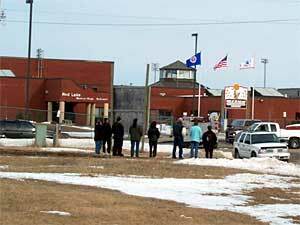 Red Lake, Minn. — (AP) - Jeff Weise hadn't been to Red Lake High School for a while, banished to his home for a violation of school policy. When he returned to the building where he was teased as a loner and misfit, it was with guns and a plan. It was a plan he carried out to deadly results. Weise, 17, who apparently used the German term for "Angel of Death" to identify himself on Web site postings, is believed to have killed nine people and injured 14 before shooting himself - while terrified students and teachers hid in classrooms and made desperate calls on their cell phones. Before heading to school Monday, Weise had business to take care of at the home of his grandfather, 58-year-old Daryl Lussier, a well-liked tribal police officer. He went to the home with a .22 caliber handgun, claiming his first two victims in Lussier and his companion, 32-year-old Michelle Sigana. Weise headed for the school shortly before 3 p.m., driving his grandfather's police vehicle, wearing his bulletproof vest and now armed with his service weapons, a shotgun and a .40 caliber pistol. Entering the school, he met two security guards and fired twice. The guards, a man and a woman, were unarmed. The female guard, Leann Grant, was able to escape down the hall, collecting students along the way. Her partner, 28-year-old Derrick Brun, was Weise's third victim. "He was a kind and gentle person," said his cousin, Nancy Richards. She said Brun didn't carry a gun or wear a bulletproof vest. Students and teachers in the school heard the pops, but it wasn't clear right away what was happening. It sounded like someone banging on school lockers, according to Andrew Auginash, recounting what his 14-year-old brother Ryan told him. Auginash's brother was shot but survived. Inside the principal's office, secretary Val Clark, 35, heard a loud noise, and headed toward the hallway where she saw people running farther into the school. School counselor Keith Lussier "grabbed me and shoved me back into the office. He said, 'There's an intruder in there.'" Lussier got on the phone, while Clark, her daughter Janelle, 15, and two others locked the door. On the black-and-white security monitors, Clark saw Brun's body. Clark and her daughter crawled into a corner and held each other. Others in the office hid under desks. The sound of gunfire sounded close, then farther away. Clark tried to use her cell phone, but the battery was dead. She tried to get an outside line on the school's phone, but couldn't. Walking down the hallway, Weise first met a teacher and a group of students, according to authorities. They fled as he fired, but Weise followed the group into a classroom, where he shot and killed several students and a teacher, 62-year-old Neva Winnecoup Rogers. Police and witnesses aren't certain of the exact sequence after that, but they say Weise began to wander through the school, firing indiscriminately. Authorities believe victims were chosen randomly. Witnesses said Weise smiled and waved as he fired off shots. At some point, a fire alarm sounded. Another student, Ashley Morrison, was in a Native Culture class when she heard shots, saying they sounded "like banging, like books." Then she saw Weise walk by her classroom, carrying what looked to her like a 12-gauge shotgun. "I just knew he had a gun and he just started shooting everywhere," Morrison said. "We could hear numerous shots and kids screaming." Students hid under their desks. Morrison took out her cell phone and dialed her mom, who got the call at work. "It was my daughter and she was screaming and she was crying," said Morrison's mother, Wendy Johnson. "'Mom, he's at the door, mom, he's going to shoot me.'" Authorities said the local public safety department got several 911 calls around 2:55 p.m. reporting shots fired at the high school. One call was placed by school Superintendent Stuart Desjarlait, who used a student's cell phone as the student barred a classroom door to keep Weise out. The student, Justin Jourdain, said Weise fired a bullet into the door, but it didn't go through. Morrison said Weise also tried but failed to get into her classroom, then moved on. Martha Thunder said her son Cody was in a classroom that Weise entered. His first shot struck a clock on the wall, his second struck Cody in the hip, Thunder said. He survived. Fourteen-year-old Reggie Graves said teachers moved students from room to room, trying to get as far as possible from the sounds of gunfire. Graves said he heard Weise ask a student if he believed in God, "and then he shot him." Morrison said she and other students heard a girl scream. "He shot her and there was no more screaming, and we knew she died." Another student, Sondra Hegstrom, told The Pioneer of Bemidji that she heard a girl saying, "No, Jeff, quit, quit. Leave me alone. What are you doing?" In all, Weise killed five students at the school. It's unclear how long it was between when the shooting started and police arrived at the school. Authorities said it took just two minutes for police to respond after the 911 calls, but Jourdain said he and other students waited 25 minutes before they felt safe enough to finally leave their classroom. When police did arrive, they traded shots with Weise in the hallway. He retreated to the classroom where most of his victims lay dead, finally turning the gun on himself. Students were quickly evacuated from the school. "We had to evacuate the school and there were just trails of blood," Morrison said. "We saw the security guard and we knew he was dead."